Home > Food > Why You Are What You Eat and Not What You Avoid Eating. Top Healthy Eating Tips from Fitness Coach Guest Blogger. You are what you eat — if you know how. Balanced nutrition will see you healthy, happy and full of energy. Food fitness is a balanced, all-rounded approach to food. It is not by avoiding certain food groups or dieting that you get results. Healthy living means eating real, clean food. To get there you introduce it step-by-step. And – before you know it: You are what you eat. This great guest blog by Dave Smith, a top Canadian Weight-Loss and Fitness Coach, will get you inspired. Dave shares his easy to apply healthier living tips with The GOODista readers, and top 50 healthy food blogs. If you want to read more from Dave, check out his site: Make Your Body Work. Feel free to comment, share and tell us how you got into healthier foods. Those answers are ridiculous (and socially awkward). When someone asks us a simple question it’s just commonplace to give a positive answer, not an elusive one like the two examples just mentioned. There is an exception, however. When it comes to defining our diet, we very often describe what we eat in negative terms. Another common example is the “vegetarian” label some people choose to describe themselves as. Being a vegetarian sure sound healthy – Don’t they eat only vegetables? There’s a new term called “Junk Food Vegetarians” that describes people who claim to be vegetarians but actually don’t eat any vegetables at all. They survive on processed grains like bread and pasta and throw in some cheese and the occasional fruit to round out their diet. Many vegetarians are in fact “non-meat-eaters”. Their title has nothing at all to do with what they eat. Why Do We Define Our Eating Habits In The Negative? Why do so many of us think of our diets this way? And – why is it so important what we don’t eat? One explanation is a basic human desire to make up rules to follow. Eating a healthy range of foods can be challenging. There are many variables to consider and it takes a conscious effort to choose foods that are most nutritious. On the other hand, it’s pretty simple to rule out a certain type of food with hopes that this elimination process will lead to a healthier diet. Saying “No” to sugar is simpler than saying “Yes” to a good variety of nutrient-dense fruits and vegetables. Another factor is media and the business side of the health industry. People generally like learning about bad news more than they do good news. So it’s a popular ploy to demonize a certain food as the next big killer. People flock to sensationally bad stories like this. A good example came about in the early 2000’s when the Atkins Diet took the health world by storm. The rules of this diet basically outlawed any carbohydrate-dense foods. Grains were gone. Fruit – gone. Many vegetables – gone. At its peak, one in every eleven adults in North America were following the Atkins Diet in an attempt to lose weight. It was simple, it was relatively easy to follow, and it was an engaging piece of health “news” that people couldn’t get enough of. Unfortunately, people on the Atkins diet and those on many other diets focused on what not to eat without taking too close of a look at what they were eating. It’s no wonder obesity rates have tripled in the last 30 years – We’re too busy avoiding “bad” foods to make sure we’re eating the good ones! For 3 days write down everything you eat. Be sure to include all food and drinks so that you can get a clear picture of what foods you do tend to choose. Looking at your 3-day food log, what is one thing you want to start eating? Remember, your goal is to start eating healthier foods, so avoid the temptation to pick those foods you want to eliminate. Deciding to add broccoli to your diet is only helpful if you’ll actually follow through and end up eating it. This can be challenging when you try to add healthy foods that you aren’t used to preparing. Take advantage of online resources such as the Top 50 Healthy Food Blogs to find healthy meal ideas that include the food you’re looking to incorporate into your diet. Now you can repeat the process by choosing just one more food to add in the following week, and then find a meal you enjoy that includes that healthy ingredient. Soon your diet will be focused on all the great foods you eat, not the foods you’re trying so hard to avoid. 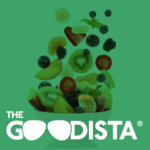 The GOODista is so grateful to Dave for sharing his easy to apply tips and resources, and we love the Top 50 Healthy Food Blogs! PreviousAre You Uniquely Able or Just Normal? Clear, good advice, and fun too, congratulations! And then we are all back to what we hopefully once learned, the balanced food pyramid! You know it when you feel it: a balanced meal makes you full of energy and a feeling of wellness!